Aston Villa’s main striker, Christian Benteke is out with a hip injury, the extent of the injury will be evaluated today. But one thing is for sure, he will miss out on the League Cup game against Tottenham. 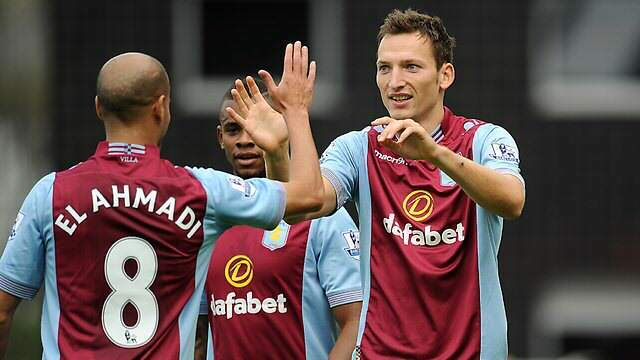 So who will step up and the lead the attack line for Aston Villa? Helenius and Kozak, the two summer recruits from Aalboog and Lazio. These two players have a completely different playing style, but a very similar skin. Both are very tall, physical, strong players and both are good in the air. However, their playing styles are different. Helenius is very good on the ball, his technical ability is very good, yet we haven’t seen too much of that at Aston Villa. Kozak, is very good in the air, can cause chaos in the box. Benteke will be hard to replace, he has already scored 5 goals in 6 games. Kozak and Helenius have scored 1 goal in 5 games between the pair, however both have only came off the bench. However, both have high scoring potential’s, Helenius has scored 40 goals in 102 games, last year he was the second top scorer in the Danish League, while Kozak was the Europa League top scorer. I feel as though Aston Villa have become a little bit too predictable with Benteke, it’s often a long ball to Benteke, bring it down and find Agbonlahor or Weimann. Kozak and Helenius allows Aston Villa to play differently and a lot more unpredictably. I’m fairly confident that Villas-Boas and Pellegrini know very little about both Helenius and Kozak so it will be much more difficult to prepare. Also, it will be difficult to see how Lambert will set up his team. Will we see Albrighton and Tonev or Bacuna providing width this week? Or will Villa continue to play narrow and on the counter? Benteke is a massive miss, but I feel it would be a good idea to switch it up a little bit in attack. Let’s try a different style of play and become a little less predictable. I for one am excited to see how our summer recruits will fare against Tottenham and I’m curious to learn wether or now Lambert has unearthed under attacking gem. The other thing as well is that we need to sort out our home form, and if that means mixing it up by swapping round Kozak and Helenius with Agbonlahor, Wiemann and Benteke, then we need to start seeing how well different formations work. Helenius could well be the attacking midfielder who can not only take the ball on the ground from defence/midfield to our strikers but he can also score goals himself. It will be good to see Sylla in action too. Im also excited to see Helenius starting, theres a reason why Real madrid wanted him to lead their B team, i think this kid has got it in him to be a star. Hopefully we see some glimpses tonight. Wont harm to play a game without Tekkers either. 90 Mins for sylla would be good going in to the City game as a disciplined DM is a must there. A good positive article! I like it. I am very excited about Helenius especially. His foot work is exceptional and can run rings around defenders I think. Now that is something we havn’t had in a long time. Kozak I feel will always do his job and work hard. I would like to see this as our team, and no its not a joke haha but it is something different and could be interesting to see, as its only a cup game! Baker if fit in for Vlaar or Clark. If Luna unfit, Bennett in. I like your team and I agree with the formation. But, Luna, Clark and Delph will probably not play today. So I’d place Lowton, Bennett, Baker and Weimann in the squad. Delph might be injured too but I agree with that line up, looks good to me. helenius-kozak. With steer in goal. Do i tink we can win with this team? No absolutely not but we can’t risk other players i feel. I wish Lambert could call on Gardner today, I think he could’ve impressed and finally broke into the first team. Injury is harming his career and I do hope he returns very soon. I did want Lambert to perhaps call on a youth player or two, but all our best are out on loan. Personally id give Donacien and Drennan 60 mins each. Donacien could be a solid defender and seeing as were quite light in that department why not give him a chance to get some experience.